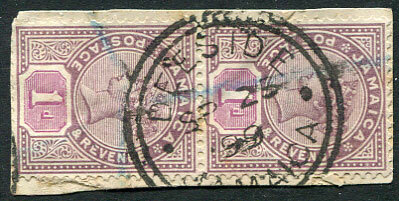 (D/R) SP 25 99 on pair QV 1d Keyplate (SG.27) fragment. 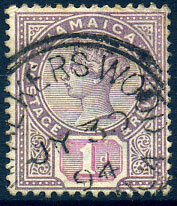 (D/R) JU 12 96 on QV 1d Keyplate (SG.27). (D/R) OC 7 98 on QV 1d Keyplate (SG.27) mourning fragment. 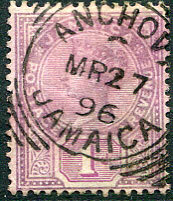 (D/R) MR 8 95 on QV 1d Keyplate (SG.27). 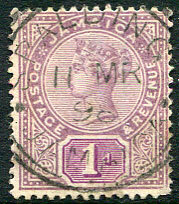 (D/R) 11 MR 98 on QV 1d Keyplate (SG.27). (D/R) OC 13 99 on QV 1d Keyplate (SG.27). 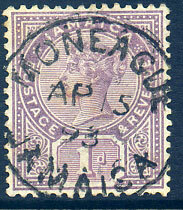 (CDS) A/FE 12 95 on QV 1d Keyplate (SG.27), stain left side. (CDS) 9 AP 00 on QV 1d Keyplate (SG.27). 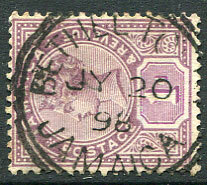 (CDS) B/20 JY 93 on QV 1d Keyplate (SG.27) piece. 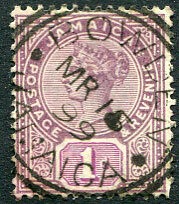 (D/R) MR 16 99 on QV 1d Keyplate (SG.27). 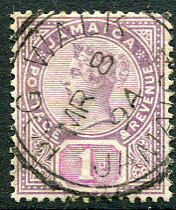 (D/R) MR 8 94 on QV 1d Keyplate (SG.27). (D/R) JY 20 98 on QV 1d Keyplate (SG.27). (D/R) AP 14 98 on QV 1d Keyplate (SG.27). 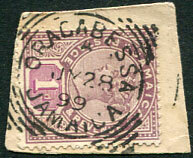 (SQC) C/MR 27 96 on QV 1d Keyplate (SG.27), ink slightly diffused. 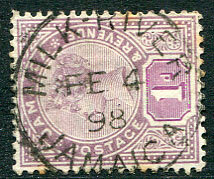 (CDS) FE 4 98 on QV 1d Keyplate (SG.27), minor toning. 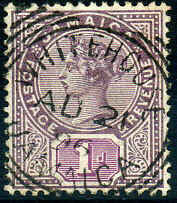 (CDS) AU 29 99 on QV 1d Keyplate (SG.27). 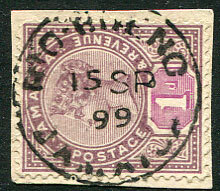 (CDS) 15 SP 99 on QV 1d Keyplate (SG.27) fragment. 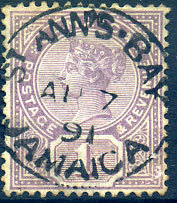 (CDS) A/JA 25 92 on QV 1d Keyplate (SG.27). 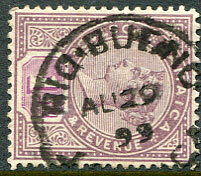 (CDS) 8 AU 94 on QV 1d Keyplate (SG.27). 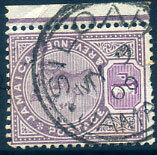 (D/R) AP 1 98 on QV 1d Keyplate (SG.27), reverse stains. 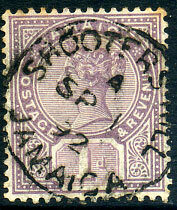 (SQC) A/JY 28 99 on QV 1d Keyplate (SG.27) piece. (SQC) AP 21 96 on QV 1d Keyplate (SG.27). 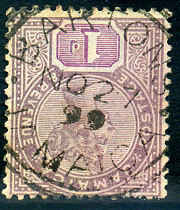 (D/R crosses) AP 25 99 on QV 1d Keyplate (SG.27). (SQC) 11 SP 91 on QV 1d Keyplate (SG.27). (D/R) JY 22 96 on QV 1d Keyplate (SG.27), toning. (SQC) no code/JA 23 93 on QV 1d Keyplate (SG.27). 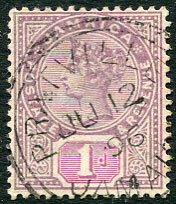 (D/R) AP 30 99 (30 inverted) on QV 1d Keyplate (SG.27). 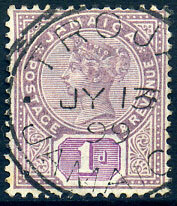 (D/R) JY 13 99 on QV 1d Keyplate (SG.27). (SQC) AU 21 96 on QV 1d Keyplate (SG.27). (SQC) C/6 AU 92 on QV 1d Keyplate (SG.27). 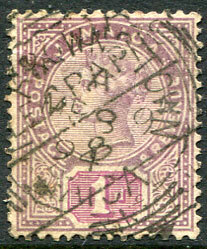 (D/R) OC 13 98 on QV 1d Keyplate (SG.27). 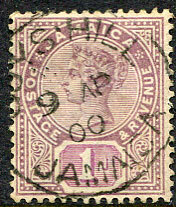 (CDS) A/NO 14 98 on QV 1d Keyplate (SG.27). 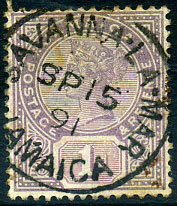 (CDS) A/SP 1 92 on QV 1d Keyplate (SG.27). 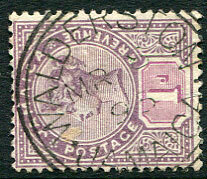 (CDS) SP 15 91 on QV 1d Keyplate (SG.27), toning. 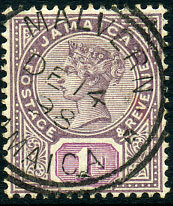 (D/R) 25 JA 97 on QV 1d Keyplate (SG.27). (D/R) JY 30 94 on QV 1d Keyplate (SG.27). 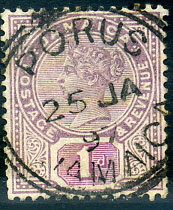 (D/R) OC 3 98 (dates inverted) on QV 1d Keyplate (SG.27), perf. fault. 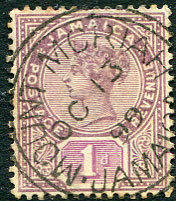 (CDS) A/MY 1 91 on QV 1d Keyplate (SG.27). 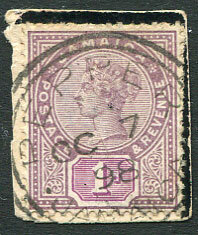 (D/R) NO 27 99 on QV 1d Keyplate (SG.27). 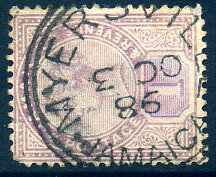 (D/R) DE 6 95 on QV 1d Keyplate (SG.27), stained. (D/R) FE 5 96 on QV 1d Keyplate (SG.27). (D/R) DE 17 97 on QV 1d Keyplate (SG.27). (D/R) MY 9 00 on QV 1d Keyplate (SG.27). 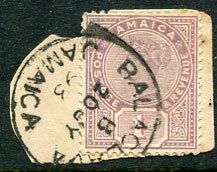 (CDS) AP 7 91 on QV 1d Keyplate (SG.27). 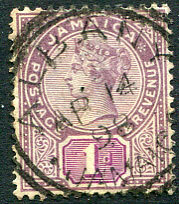 (CDS) AP 15 93 on QV 1d Keyplate (SG.27). 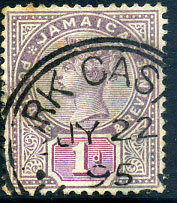 (D/R) JY 2 94 on QV 1d Keyplate (SG.27). 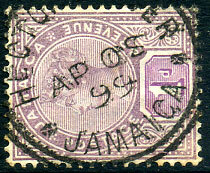 (D/R, short-lived Maltese Crosses) DE 14 98 on QV 1d (SG.27).